We recently had a chance to put a display in a large, professional trade show. The booth price was excellent and we thought it was a great opportunity so we decided to try it out. We have never displayed our products this way before and were quite excited about it. The show was only two weeks away, so we would have to move fast if everything was to be ready in time. Before we go too far, let’s look at how a large trade show is created (as I understand it). Let’s say the City of Hamilton is going to put on a Home & Garden Show. They will hire a company which specializes in managing these types of shows. The managing company will then arrange other contracted services – eg. electrical, lighting, plumbing, decorating, audio/visual. The managing company will also arrange for the insurance, permits, licenses, and whatever else is required. Finally, we get to the the Exhibitors (vendors). Those are the people who are renting booths in the show to ply their wares on the visitors. 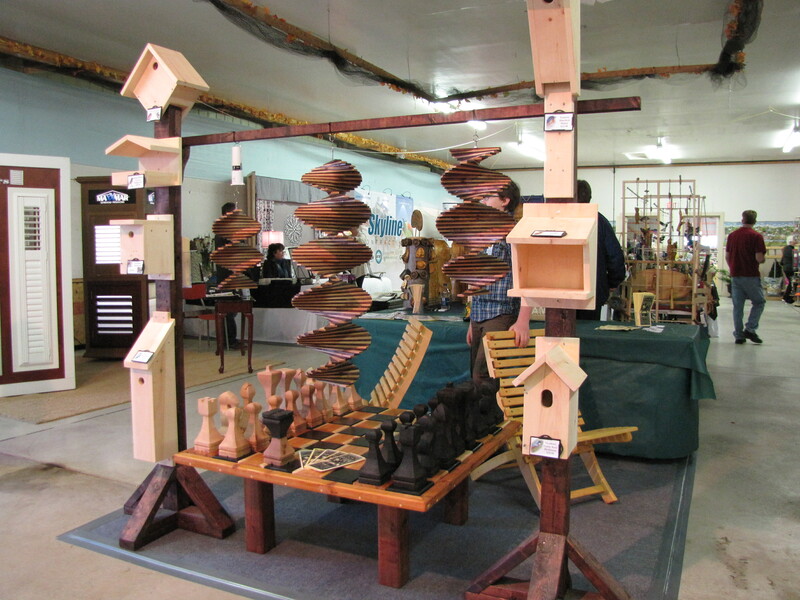 Since we were applying to be vendors in the show, we were dealing directly with the managing company. The process is pretty simple. We inquired about availability, they responded with a floor plan marking the available booths in our price range. We picked one. A couple forms were filled out and sent to us to fill in credit card information and things like that. Along with the forms came the Exhibitors Information Package. This is where we suddenly bogged down. One of the duties of the managing company is to ‘unify’ the show, to ensure that the entire show presents itself in a clean, pleasing, professional manner. This is to ensure that visitors are in a comfortable, friendly state-of-mind, so that they will be more likely to purchase, or at least inquire, about the vendors products, which makes the vendors happy. Good sales and happy vendors, means that the show will grow from year to year and the managing company will get more work. 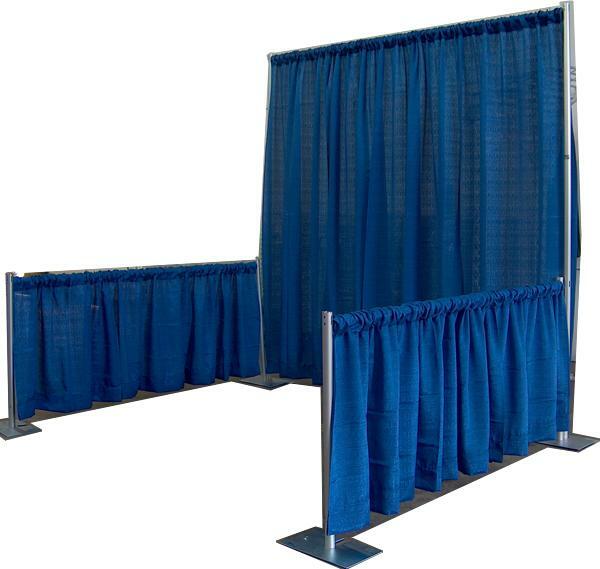 There are a lot of things about these trade show booths that we needed to know. For starters, the size. 10’x10′ seems to be the standard, if you want a bigger space then you rent the adjacent booths. What about the cost for that 100 square feet? You can expect to pay anywhere from $100 – $1500+. It all depends on the show and where the booth is in the floor plan. What you get when you rent the booth is a piece of floor, with a tube-framed curtained divider seperating you from your neighbour. This is your little piece of the world and you can do with it as you please assuming that you meet the rules and regulations posted by the managing company. That was okay, we weren’t paying a lot for our 10 ft.sq. booth hidden near the back corner adjacent to the child drop-off area. It was just for the experience. So we started working out the logisitics, and reading the Exhibitors InfoPak. 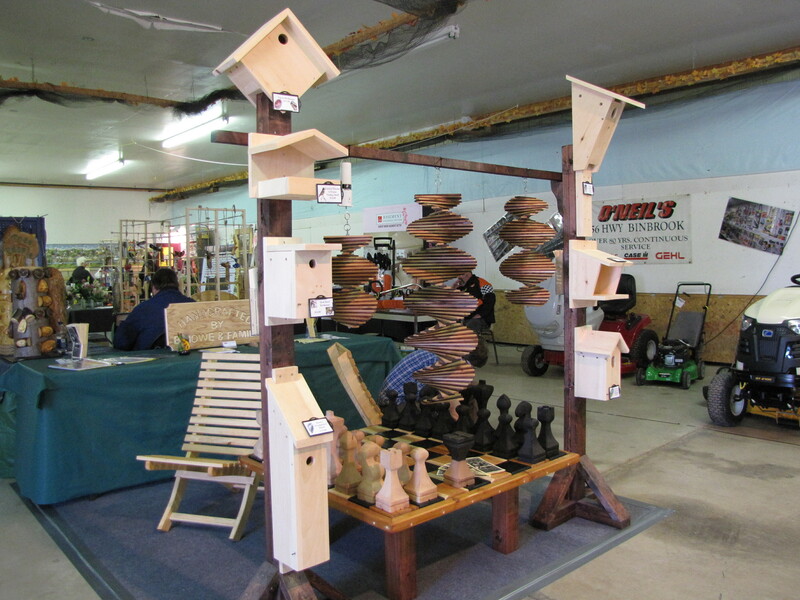 We have a small display – a couple of posts to display the birdhouses, a cross bar for the whirlwinds, a 6′ table for brochures and taking orders, and the chess set which is it’s own table. We wouldn’t need much, we thought. Insurance – the shows insurance covers anyone in the aisles, not in the booths. So we would have to get vendors liability insurance. This costs somewhere around $85-$100 for the weekend. Electricity – of course, for a significant fee the show electricians would run power to the booth as long as we arranged it with them before hand. Carpet – this is mandatory at many shows to protect the facilities floors, and to reduce the noise level. You can supply your own suitable flooring, or rent it from the decor company. Internet Access – had to be set up with the shows telecom provider prior to the show. So, what started out being around $200 to rent a booth turned out to be closer to $750 if we actually wanted to use it. There are a lot of people with their hand in the cookie jar at these large shows, and each comes with a fee. I can’t imagine the bills the truly large displays have to pay – you know, the ones with ponds, and walkthrough gardens and such. I’ve seen display systems and designs running into the tens of thousands of dollars, before the show fees. You have to move a lot of product to cover those kinds of costs. At the end of the day $750 (+ travel expenses) is not a bad price for a spot at a large show where you may get a lot of exposure – if you can be sure that you’ll generate enough sales to cover your costs. However, we’re a young, garage-based business, and we couldn’t validate spending that much money on a whim. For the time being, we’ll be sticking with the smaller shows. The local fairs still require insurance, but they usually don’t demand that you rent things like carpet and lights. We’ll start small. Get a handle on the basics and work our way up to the big leagues.